I have a perfectly lovely study which my husband built for me tacked on to the end of the house. He calls it a shed because the walls are wooden but they rest on low brick walls and the room is integral to the rest of the house. The views all round are over the garden and its very quiet and peaceful at the back of house. So where do I write? In coffee bars all over London. Insane, I know. But there is something about packing up the Netbook and the USB stick, jamming the freedom pass into a pocket and taking off down the road which kicks starts all the creative juices. Coming downstairs and switching on the computer in the same building, without even going outside, doesn't really do it for me. I’ve written four novels in the Costa in Golders Green and the same barista, Marie, was there when Hidden was published. They’ve passed it round under the counter for a couple of years. But in the past year I’ve been branching out. I now regularly meet Sue Hyams at the Royal Festival Hall. 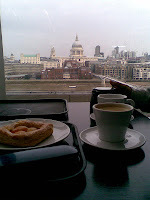 She is a member so we have the privileges of the Members Room on the Sixth Floor overlooking the Thames. We sit opposite each other tapping away happily on our laptops, telling ourselves we've gone out for a day’s work at the office! My latest find is the Costa in Covent Garden, tucked away behind Neale Street. Now that really feels like an outing. I go early in the morning, grab my fave table and by the time the lunchtime crowd have built up, I've done my chapters and I'm ready for a stroll. There are so many lovely places to wander around in town it feels like a proper day out. I've written in cafes and at pavement tables all over the world. I’m not distracted by the buzz of people around me and only occasionally do I find the choice of music annoying. There is something about other people’s lives, alongside mine but not encroaching, which keeps me focused. I like the feeling that I am out in the world and not shut up at home but I'm writing. Of course I do write in my study and there are days I simply don’t want to go out. But I've been writing in coffee bars since I was a teenager. I don’t think I will be kicking the habit any time soon. I do admire you. I wish I could go out into the world and write but firstly I would be too embarrassed to sit at a cafe table with my netbook open and secondly I'd be too distracted by all the fascinating characters who come and go. I love that view from the 'elitist' lounge. What a fabulous city London is! This was a very interesting post. I have always imagined that if I could work full time as a writer that I would still write at home at my desk. After reading this I realise that when writing doesn't have to be squished into the dark hours then the urge to write elsewhere might be irresistible. Love this. I feel exactly the same way. Problem is, writing in a cafe is generally more expensive than writing at home... When I'm feeling flush and a deadline is looming, I head for the Riverside Cafe at the Maltings here in Farnham. I cracked out a whole book in 10 days last time I went there! I do that too! I love it. And I love it when the staff is happy with you just having one coffee all morning and tapping away. But I envy your study! I do feel suitably guilty that I have a beautiful study and still go out to write. But I wrote my first novel on the kitchen table while the kids were in bed - so it wasn't always like this. I used to write in a cafe when my kids were small. The three hours they were in playgroup was my writing time. I don't do it now though...liked this post very much. Hi Miriam - will look out for you and Sue when I am at Festival Hall. It is getting very busy these days but I love the warmth and buzz of the place. When my children were very small I did a number of daytime classes at a school whilst they went to the creche. But I'd soon made enough curtains and realised that I was no good at yoga, so I asked the school if I could just work in the school library instead? They let me (no CRB check back in the 90s! ), and I wrote a whole novel that way, just a couple of hours a week. I've always worked in cafes - and libraries, and sitting on the edge of canals in Venice and on trains and buses and *anywhere*. And, like you, I have a lovely office at home AND a desk downstairs next to the library. There is just something more inspiring and relaxing about working out of the house. 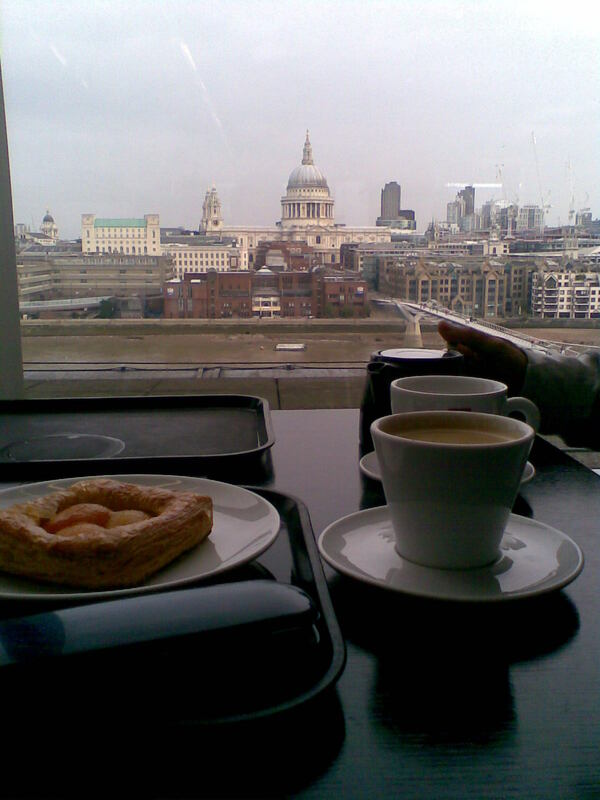 I sometimes have meetings with one of my publishers at RFH, so I'll look out for you next time!. Lovely post, thank you. Always. Yes. Caffe Nero in Macclesfield - or anywhere where the coffee is equally tremendous and I can carve out a little bit of own world with a table to myself, a Moleskine notebook, a scruffy sheet of A4 paper about to be recycled, a HP pencil, a black gel pen and a head full of dreams. When I lived in London, the British Library reading rooms used to do very well too. I do most of my writing while pedalling my tricycle.I have to come back and actually type it up of course but I know what I am going to write. Oh dear, perhaps that is why (unlike all the amazing writers her) I remain unpublished. Stroppy, you are particularly amazing. If I remember you even kept on writing while caring for a very demanding and naughty pig! So glad the pig came up again! ( I miss our exchanges Stroppy). Yes _ Lynda and Stroppy, let me know if you are coming to the RFH and we can meet up. 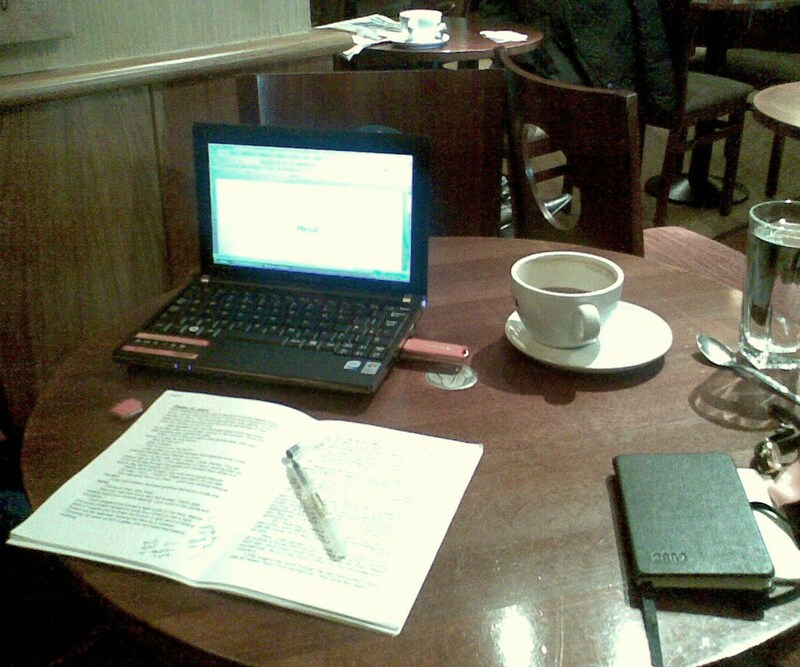 Isn't it amazing how many of us write in cafes or elsewhere outside the home. Thanks for all your lovely comments. Maybe I could rent your study?